Roasted Bell Pepper Tacos. Oven roasted bell peppers are flavored beautifully with onions and spices and complimented with Chipotle seasoned black beans and orange honey glazed chicken. 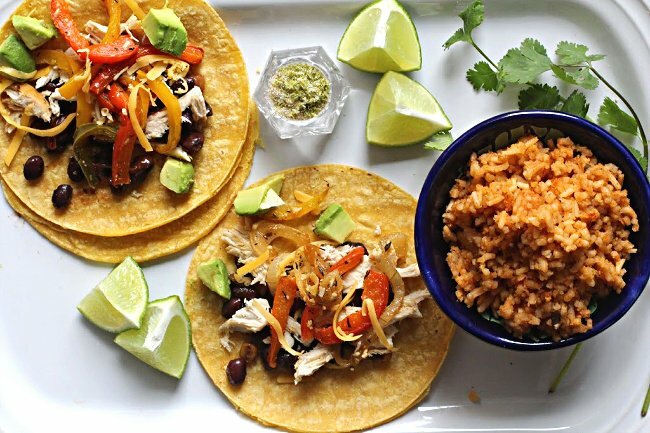 A healthy taco recipe that you’ll will wow your crowd and one you’ll want to make over and over. One of the best taco recipes I’ve ever made. 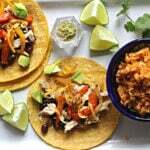 If you’re looking for a unique taco recipe, one that will wow, one that’s lean in calories and mean with flavor, I hope you’ll give this roasted bell pepper taco recipe a try. I served it to guests a couple of weeks ago and it was a big hit. Taco recipes are known for being an easy dinner option. I wouldn’t place this particular recipe in that category. 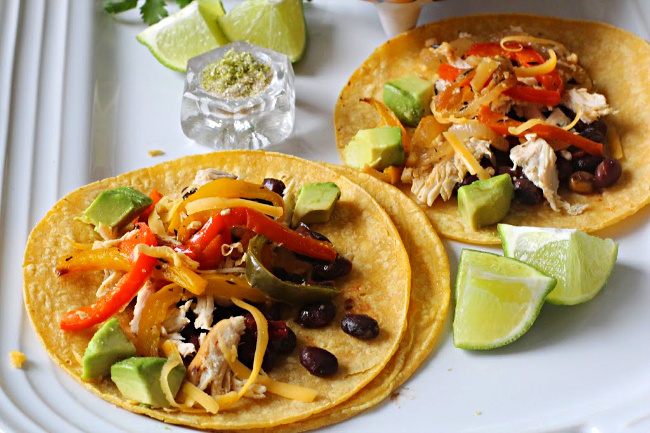 These tacos have several steps that create a beautiful layer of flavors. I would’t call this a hard recipe, but it is a somewhat time consuming. Don’t let that stop you, it’s worth every single step. Let’s take a look. There are three components of this roasted bell pepper taco recipe, so let’s take a look at the layers that make up this delicious taco. The black beans can be made in a saucepan on the stove top and then kept warm until you’re ready to build the tacos. This process is simple, using two cans of black beans, drained and one can of chopped tomatoes, undrained. chipotle chile powder, garlic, Mexican oregano and cumin are all you need to season. Heat them up and keep them warm. Simply stir together a mixture of honey, chipotle chile powder and orange juice. Place boneless skinless chicken breasts in an oven-proof pan and roast for about thirty minutes at 350 degrees, or until juices run clear. Baste the chicken with the glaze twice during the baking time. Let the chicken breasts cool and then shred the meat. Tent with foil and keep warm. Use three bell peppers. One red, one yellow and one green. After cutting off the tops and the bottom, trim the inside of the peppers of the thick veins and then thin slice them. Slice one large onion. Raise that oven temperature to 400 degrees. Using a sheet pan, toss the peppers and sliced onion with olive oil. Season with sage, smoked sweet paprika, thyme and salt. Toss again to distribute seasonings. Cook for 30 to 40 minutes, or until peppers are starting to brown. Stir the peppers with tongs a few times during the roasting process. This cumin, lime flavored salt is the crowning glory for these roasted bell pepper tacos, so I beg you not to skip this simple process. Just grate one lime for it’s zest and place it in a small bowl. Add salt and cumin and bam = done. You’ll pass this at the table for guests to sprinkle on top of those roasted bell pepper tacos. You simply can’t just take soft corn tortillas out of the package and make tacos. They need to be reheated to make them soft so you can roll them, or fold them. My method of choice comes from a recommendation from Rick Bayless. Take a clean dish towel and moisten it with water. Place eight or more corn tortillas on the towel and wrap the towel around the them. Place the package of tortillas into a gallon sized zip-lock bag. Don’t seal the bag. Place the bag of wrapped tortillas in the microwave. Microwave for four minutes at 50% power. Then let the them steam inside the bag for at least four minutes. They’ll stay nice and warm for longer. Shred Medium Cheddar Cheese, White Cheddar Cheese or crumble Queso Fresco to top these glorious Roasted Bell Pepper Tacos. Even though my photos show grated Medium Cheddar Cheese, which I already had on hand, I would recommend using a white cheese or white Mexican crumbling cheese for appearance. The white cheese will showcase those beautiful tricolored roasted bell peppers. That there you have it. No salsa needed, but don’t forget those chopped avocados. I hope you give these Roasted Bell Pepper tacos a try. The Hubs think this is the best taco recipe I’ve ever made. And if you do, please come back and give this recipe a star rating. And leave a comment about your experience with the recipe. And if you have a favorite oven roasted peppers recipe, let me know, I’d love to give it a try. Serve these tacos with a side of Spanish Rice, this Jicama and Orange Salad, or a tossed salad like this Baby Kale and Apple Salad with Cider Vinaigrette. I’m sharing this recipe with Meal Plan Monday – check it out. Roasted Bell Pepper Tacos. Oven roasted bell peppers are flavored beautifully with onions and spices and complimented with Chipotle seasoned black beans and orange honey glazed chicken. A healthy taco recipe that you'll will wow your crowd and one you'll want to make over and over. Heat oven to 350 degrees. Combine the chile powder, honey and orange juice. Mix well. Place the chicken breasts in a greased baking pan. Coat the chicken with half the glaze. Bake 30 minutes, or until juices run clear. Basting with remaining glaze half way through the cooking process. Remove chicken and tent to keep warm. Raise oven temperature to 400 degrees. On a rimmed sheet pan, toss together peppers, onion, 1/4 cup oil, 1/2 teaspoon salt sage, paprika and thyme. Spread vegetables out in an even layer. Roast until tender and lightly browned, 35 to 45 minutes, tossing every 15 minutes or so. In a sauce pan, toss together beans, tomatoes, chipotle chile and sauce, garlic, oregano, cumin and salt to taste. Bring to a simmer and cook for about 10 minutes. Drain beans of liquid before serving. To warm corn tortillas, place tortillas in a damp clean dish towel. Wrap the towel around the tortillas and place the tortillas and towel in a gallon sized plastic bag. Don’t seal the bag. Cook in microwave for 4 minutes at 50% power. Let rest at least 4 minutes before using. .
To serve, top tortillas with beans, peppers, avocado and cheese. Add a squeeze of lime from the wedges. Let people sprinkle on lime-cumin salt to taste. For the beans, you can substitute 1 canned Chile in Adobo for the Chipotle Chile Powder. Also add 1/2 teaspoon of the adobo sauce. Serve with Spanish rice as a side dish. You had me with the title and the recipe & photo looks great – lot’s of flavors going into this. Did yo place those ingredients in there one at a time for a big time pic? One of our favorite local Mexican restaurants serves a chicken and black bean tostada that I love. 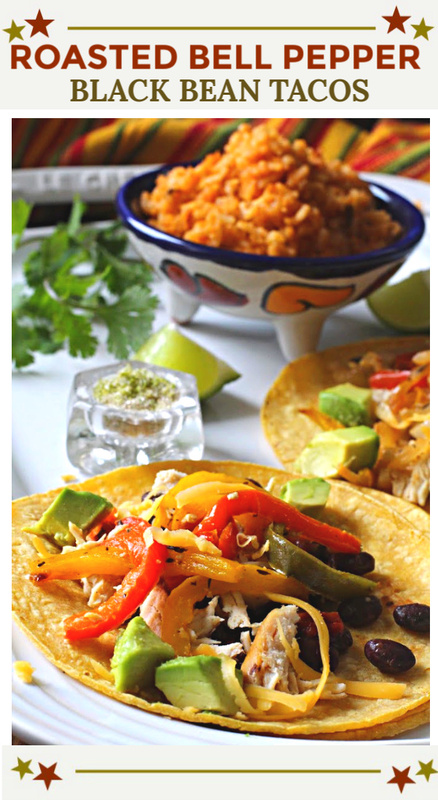 These tacos sound delicious and I love the seasonings and peppers in your recipe! Gotta try that cumin salt! Love tacos, and am always looking for new ideas for making them. These look excellent, and great tip for softening the tacos. Thanks! Great Tacos! So simple and tasty. Love the chipotle orange glaze for the chicken. Lots of flavors in these tacos. Thanks for a great taco idea! Hi MJ – and thank you so much. Looking forward to making this soon! I love tacos but we enjoy to try out new flavors. I hadn’t tried making a bell pepper filling yet. I’m totally making these! And thanks for the heating tips for the tortillas!! Our kids and grandkids are coming in March to ski, and this is officially on the menu. I could eat this every night of the week! I have been adding more beans and vegetables to my diet and tacos are the perfect vessel for that. I’d be happy to eat this for dinner any night!